Are Pink Diamonds Real Diamonds? For many years, people could recognize an engagement ring just by looking at it. The traditional look has always been a round diamond in a solitaire setting with a simple gold or platinum band, sometimes with a decorative halo or a pair of baguettes for extra sparkle. These days, however, engagement rings take on many shapes, sizes, and colors— just like the people who wear them! 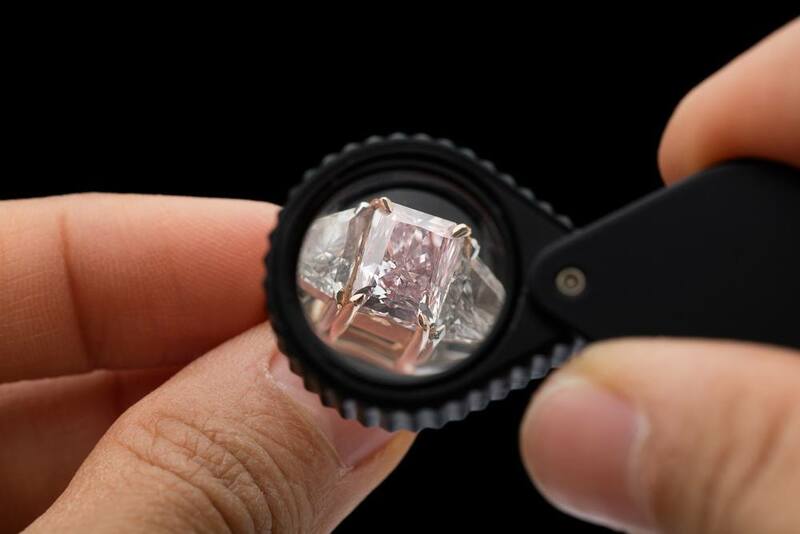 Different diamond cuts like princess, cushion and Asscher are getting more attention, and colored gemstones like pink diamonds are becoming popular in a big way. The wide variety of engagement ring styles means that couples have more room for self-expression and creativity, but when it comes to colored diamonds, it can be hard to know if you’re getting the real thing. Especially with rare colors, like pink diamonds. The first question most people ask when it comes to pink diamonds is a simple one: are they real? The answer to this question is equally simple: yes! Diamonds exist in a rainbow of colors, depending on the presence of elements other than carbon in the crystal lattice when the stone was formed in the earth, or the stone’s exposure to varying degrees of heat and pressure. Pink diamonds are formed due to intense heat and pressure on the stone while it is imbedded in the earth’s crust. This pressure distorts a diamond’s latticing, causing the carbon molecules to absorb green light rays. Without green light to reflect across the crystals, the diamond ends up looking pink or red when it is removed from the earth. The shade of pink you see will vary depending on the level of distortion in the diamond lattice. You may be wondering just how rare pink diamonds are. These gems are incredibly rare, and about to become more so; a majority of the world’s pink diamonds come from the Argyle Diamond Mine in Western Australia, and reports that the mine will close in 2019 mean that this precious stone is about to become scarce. Because of this rarity, pink diamonds are often marked at incredibly high prices. In 2014, the average cost per carat topped out at $78,000 – though the price does decrease as the shade of pink becomes lighter and the stones become smaller. Because pink diamonds are so rare and expensive, it is often incredibly difficult to find them in your average jewelry store. Most big box stores and retail jewelers do not use natural pink diamonds in their jewelry. As a buyer, you should always ask if the stones are natural, and the appraisal of gemological certificate should note if the stones are natural or enhanced. Going online to websites that offer fancy color diamonds is not only the way to get the best price, but also the easiest way to find a stone at all. If the high price tag of natural pink diamonds is not in your budget, don’t lose heart. 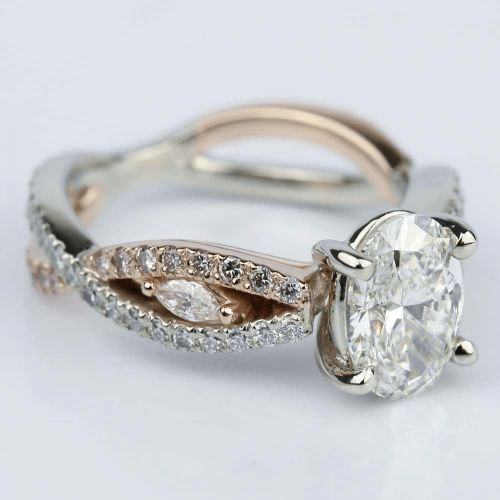 There are a couple of options that can land you that pretty pink engagement ring at a fraction of the cost. 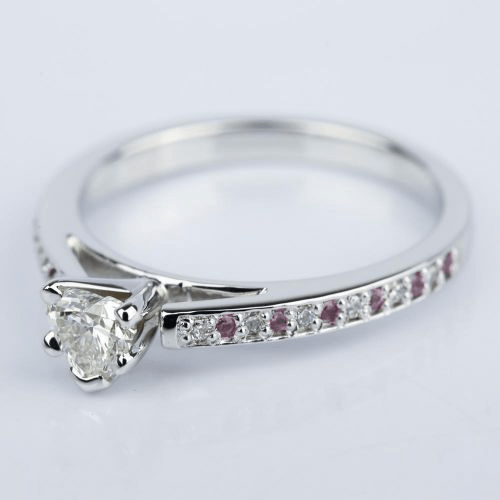 One option for a pink engagement ring without the tremendous sticker shock is to use a pink sapphire in your ring. 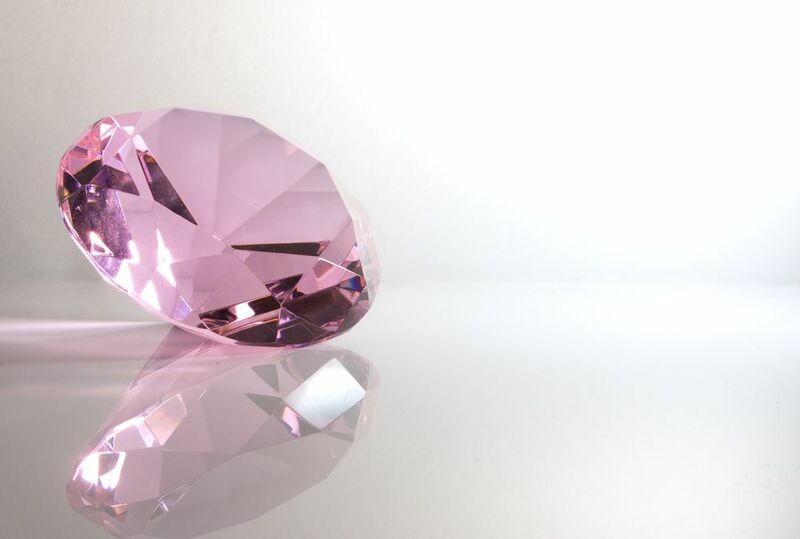 This gemstone shares the same rich pink tone as a pink diamond—sometimes, in fact, the color is even more vivid! Sapphires are also very tough gemstones, second in the world only to diamonds, which means that they will withstand all the bumping around that an engagement ring endures every day. Another option is the enhanced diamond. These stones are natural diamonds, but they undergo either a process of heat and pressure treatment or are coated in order to make the stone pink. The diamonds that are heat and pressure treated will retain their pink color, but the process does sometimes weaken the stones, so they are not considered as valuable as a natural pink diamond. Coated stones may lose the pink hue over time, and often require special care. Either way, these stones are far less expensive than natural pink diamonds, and can still be called a diamond. Ultimately, it is up to the couple to decide what kind of engagement ring they want to purchase. If your bride-to-be is in love with pink diamonds, you can either look around for the genuine article, use another gemstone that is equally stunning, or go the enhanced route. The most important thing is not the kind of stone, but how much she loves it.